The Geneseo Foundation provided a matching grant program towards to the Western Illinois University Foundation on behalf of the WIU Quad City Campus. The WIU Foundation was seeking support for an electronic classroom at the new Riverfront Campus in Moline. This classroom space is designated “The Geneseo Room” and offers students instruction using contemporary high-tech media. Using age-old techniques and volunteer manual labor, it was a step back in time as the Antique Engine & Tractor Association (AETA) constructed a timber frame barn on the site of their new location north of Geneseo. Similar in design to Midwest barns of the mid 1800's, Trillium Dell Timberworks, in association with the Timber Farmers Guild, assembled and raised the barn during the summer of 2009. 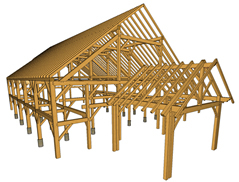 The large timber frame barn was constructed from local white oak and is approximately 48 feet wide by 70 feet long. The Antique Engine & Tractor Association's stated purpose is "To promote the collection, restoration, preservation and exhibition of gasoline and oil engines, gasoline and steam tractors, power driven farm machinery and other equipment of historical value." First organized in 1959, this non-profit organization has grown to over 200 members. 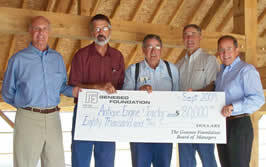 A two-phase grant totaling $99,000.00 from the Geneseo Foundation was awarded to AETA for the purpose of assisting with the barn raising and developing the new site. Noting that the Association's barn and historic display educates and celebrates local history, the Foundation's Board of Managers were pleased to support this dynamic project. L to R: Dr. Roger Pray, Geneseo Foundation board member; Chuck Bos, AETA building coordinator chairman; Bill Cole, AETA member; Tom Hitzhusen, AETA member; and Todd Sieben, Foundation board chairman. John Dedrick, father of George B. Dedrick the Geneseo Foundation's originator, spent a portion of his early life living and working in Andover, Illinois. Born in Sweden in the year 1835, John Dedrick immigrated to America at age 16. He settled in the village of Andover for the next few years. It was John Dedrick who piqued a business interest in his son, George, when at the age of 19, he purchased a 1/4 interest in his father's firm. George Dedrick would continue on to become one of Geneseo's prominent business leaders and establish the Geneseo Foundation with his $1,000,000 gift. The Village of Andover celebrated its 175th Anniversary in 2010. A Geneseo Foundation grant assisted with new welcome signs to the community. 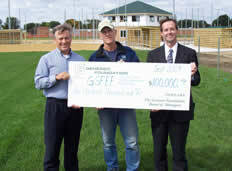 With a $100,000.00 grant from the Geneseo Foundation, a new state-of-the-art baseball and softball complex was built. Located behind Millikin School in Geneseo, the new four diamond, wheel design will host area youth games, the Geneseo High School Lady Leafs' softball games, and attract larger tournaments to the area. In addition, the complex will include a press box and concession stand at the center of the four new diamonds, and a new parking lot with 120 spaces. Added benefits for fans attending games at the complex include paved areas, bleachers around the wheel design, lighting, safety nets above the spectators' heads, and parents with children playing on different diamonds at the same time can now watch both games. With support from the Geneseo School District and city officials, the project began in mid-summer 2009. The Geneseo Foundation's grant to the Geneseo School Facility Enhancement Foundation (GSFEF) assisted with general expenses of the project.